GameTime recently released MotherTree, a treehouse that fits into natural playgrounds for young children. Designed by GameTime's custom play division, PlayWorx, MotherTree is constructed of glass fiber reinforced concrete (GFRC) and features a faux fireplace, ladybugs, butterflies and other animals sculpted into the tree. GameTime created MotherTree in response to requests for preschool playground equipment that encourages a love for nature, particularly in urban areas. It is designed to work with GameTime slides and climbers to create a playful preschool playground centerpiece. New for 2016, Land Pride's new 4-n-1 Combo Bucket is specifically designed for Kubota BX Tractors to increase the versatility of the front loader. As the name implies, 4-n-1 Buckets are designed to act like four attachments: dozer blade, scraper blade, grapple and bucket. The CB0550 Combo Bucket fits Kubota 60 and 70 Series BX Front Loaders. It features dual 2x6 cylinders, 1-inch jaw pivot points, 30-inch jaw opening, spill screen, reinforced side plates and optional third function valve. The PRO Series® Liquid Cover™ is perfect for recreational facilities interested in decreasing water evaporation and heat loss in swimming pools. Every gallon of 80-degree pool water that is lost to evaporation is the equivalent of losing 8,729 BTUs of energy. The PRO Series Liquid Cover's advanced mono-layer technology will not only decrease evaporation and heat loss, but will also reduce the need for water adjustments from water loss. Total Gym takes the traditional rowing machine concept to a higher plane with a smoother, more consistently loaded platform for the user with its new Total Gym® Row Trainer™. 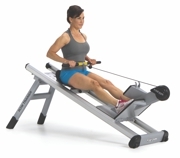 The concept of pulling one's bodyweight against gravity is the norm for the folks at Total Gym, however, the application for indoor rowing on an incline, with adjustable levels, is a completely fun, fresh and different way to row. Earth & Turf Products LLC announces its CarryCat™ tool carrier to fit three-point hitches of compact tractors. This useful attachment is designed to carry conveniently and securely most commonly used landscaping hand tools. Features include stand-alone storage with adjustable stand-off feet to suit a variety of tractor sizes, adjustable gasoline-can holder, soft-lined chainsaw mount and receiver for drawbar. Fabricated with a heavy-duty powder-coated finish.